I am unknown, but a veteran of service of the past, currently serving, or will serve in the future, with the famed 35th Infantry Division. My deeds in service, nor my service to family, city, state, or nation, may never become fully revealed for consideration as a member by name of the most honorable and distinguished 35th Division Hall of Fame. I am known by those who loved me and, as such, with pride from my view, wherever it may be, I am proud to serve as an unnamed member of the 35th Division Hall of Fame. It being that those individuals who had the vision for creating the 35th Division Hall of Fame and those individuals who are implementing the program selected me as the first inductee into this distinguished grouping of individuals. I shall always be proud in pronouncing my love for freedom, liberty, and the Santa Fe Division. Captain Alexander R. Skinker, who served with the 138th Infantry, 35th Infantry Division, during World War I, received the Medal of Honor for actions during the Meuse-Argonne Offensive on September 26, 1918. Unwilling to sacrifice his men when his company was held up by withering machine gun fire from iron pillboxes in the Hindenburg Line, Captain Skinker personally led an automatic rifleman and a carrier in an attack on the machine guns. The carrier was killed instantly, but Captain Skinker seized the ammunition and continued through an opening in the barbed wire, firing the automatic rifle until he, too, was killed. He is buried in St. Louis, Missouri. Private Nels T. Wold received the Medal of Honor as a Private in Company I, 138th Infantry, 35th Division, during the Meuse-Argonne Offensive on September 26, 1918. He advanced on a German machine gun nest, silencing the gun, and bringing with him eleven prisoners. Later that day, he jumped from a trench and rescued a comrade who was about to be shot by a German officer, killing the German. He then volunteered four more times to single-handedly attack machine gun nests and was killed by machine gun fire which concealed a fifth emplacement. His comrades then charged the position, killing the occupants and recovering Wold’s body. He is buried in Elim Cemetery in his birthplace of Winger, Minnesota. 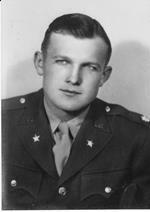 Staff Sergeant Junior J. Spurrier is the only Medal of Honor recipient from the 35th Infantry Division in World War II. A member of Company G, 134th Infantry, he received the Distinguished Service Cross for actions at Lay St. Christopher, France for spearheading an assault on a well-defended hill position. On November 13, 1944, in actions at Achain, France, Staff Sergeant Spurrier advanced alone around the Village, killing 1 German officer and 24 enlisted men in a solitary attack using his Browning Automatic Rifle, M-1 rifle, American and captured German rocket launchers, and hand grenades. Spurrier died in 1984 at the age of 61, and is buried at Mountain Home National Cemetery, Tennessee. 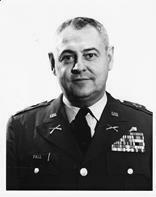 MG Paul W. Baade served as Asst. Division Commander (1942) and Commander (1943-1945) of the 35th Infantry Division, landing the Division in Europe July 5-7, 1944. He led the 35th Division across Europe, and at the end of WW II his Division was the closest American or British unit to Berlin. Commissioned from West Point in 1911, he served with the 322nd Infantry in France during World War I. He later commanded the 16th Infantry prior to commanding the 35th Infantry Division. His decorations included the Distinguished Service Medal, two Silver Stars, three Bronze Stars, and the Purple Heart. He retired in September, 1946, and died in 1959. Colonel Bernard A. Byrne commanded the 320th Infantry Regiment, 35th Infantry Division, through the Normandy, Northern France, Rhineland, Ardennes-Alsace, and Central European campaigns of World War II. He assumed command of the 320th on 26 May 1944, and was particularly aggressive in the battle of Venlo, Holland, in command of Task Force Byrne, which also included the 784th Tank Battalion, the 654th Tank Destroyer Battalion, and Field Artillery, Engineer, and Medical units. His unit was also particularly instrumental in the battle at St. Lo. He was personally decorated with the Silver Star by General George S. Patton. Colonel Paul A. Fall was awarded the Distinguished Service Cross for gallantry in action during WW II. His unit, Company G, 137th Infantry, was pinned down by enemy fire near the Meurthe River during the Crossing at Chartreuse, France. Sergeant Fall crawled forward alone and destroyed a German machine gun, then led his men in an attack that destroyed two more. He served in the Normandy, Northern France, Rhineland, Ardennes-Alsace, and Central European campaigns, including the capture of St. Lo and the Battle of the Bulge. Following the war, he remained in the Kansas Army National Guard, commanding the 1st Bn, 137th Infantry and serving in Vietnam in 1969. 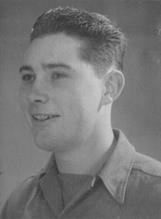 Staff Sergeant Carl J. Frantz, Jr.
Staff Sergeant Carl J. Frantz, Jr., Co E, 137th Infantry, was awarded the Distinguished Service Cross on 26 Sept 1944 for heroism at Le Carillon, France on 11 July 1944. As Platoon Sergeant, he was directing the withdrawal of his platoon under fire when two enemy machine guns opened fire on his position. Wounded in the stomach and holding his intestines with one hand, he seized a Browning Automatic Rifle and opened fire on the enemy, allowing his men to withdraw to safety. As he withdrew, he shot a sniper who had him under fire, then remained in a ditch until dark, when he walked to a medical aid station for help. His actions saved his platoon from possible annihilation. He died in 2004 at Lindsborg, Kansas. Major William Graham Gillis, Jr.
Major William G. Gillis, Jr., a graduate of West Point, received the Distinguished Service Cross for courageous leadership of his unit, the 1st Bn, 320th Inf., as the 35th Division spearheaded Patton’s Third Army sweep through France. On Sept. 15, 1944, while crossing the Rhine-Marne Canal and the Sanon River, he disregarded his own safety to personally direct the attack by wading and swimming across the river and canal several times, and the 320th met its objective. On Sept. 27, 1944, the Germans led a counterattack in the Gremecy Forest. Major Gillis went forward to provide brave leadership, and there, among his men, Maj Gillis was hit by a tree burst from an enemy mortar on Oct 1, 1944, dying on the field of battle. Brigadier General Thomas J. Kennedy served in the European Theater during World War II, after being mobilized with the 35th Infantry Division. He was in contact with the enemy for 125 continuous days during 1944-45 in France and Germany, which included penetration of the Siegried Line and the crossing of the Rhine and Danube Rivers. 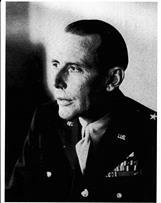 He served in the 35th Division after World War II, and then as Exec. Officer of the 69th Infantry Brigade when the 35th Division was inactivated in 1963. He commanded the 69th Infantry Brigade at Fort Carson during the Vietnam War in 1968-69, and as a Brigadier General until 1976 when he retired. He is a past president of the 35th Division Association. He lives in Topeka, KS. Major General Butler B. Miltonberger served as Commander of the 134th Infantry Regiment and Assistant Division Commander, 35th Infantry Division, during World War II, seeing action in battles at St. Lo, Vire, Mortain, Montargis, Morhange, Sarreguemines, Bastogne, Alsace, Venlo, and the Venlo River. In 1946 he was appointed Chief of the National Guard Bureau, and was instrumental in reconstituting the National Guard of the United States following World War II, as well as in the formation of the Air National Guard. 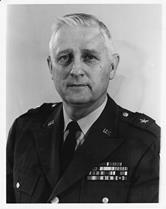 General Miltonberger died in 1977. 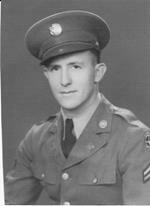 Sergeant Richard J. O’Brien served with distinction in the 137th Infantry during World War II. As a Runner and Radio Operator, he landed on Omaha Beach on July 6, 1944. Participating in the Normandy Campaign, he was involved in the capture of St. Lo. As part of Patton’s Third Army, he then was involved in the dash across France and the capture of Orleans, being wounded at Vestry, France. He and his unit crossed the Moselle River under fire and participated in the battle for Nancy, France. On Dec. 21, he joined the attack toward Bastogne during the Battle of the Bulge, and later was involved in crossing the Rhine and reaching the Elbe River. He is a past president of the 35th Division Association. Captain Harry S Truman distinguished himself as Commander of Battery D, 129th Field Artillery, 35th Infantry Division, during WW I. He led the Battery in battles at Vosges, St. Mihiel, Meuse-Argonne, and Verdun, displaying great courage and initiative while under enemy fire. Offered a Regular Army commission after the war, he chose to remain in the Organized Reserve Corps, eventually reaching the rank of Colonel. He became President of the United States in 1945 on the death of President Franklin D. Roosevelt, and served as President until 1952, following an upset victory in 1948. He is a past president of the 35th Division Association. He died in 1980, and is buried at the Truman Library, Independence, Missouri.